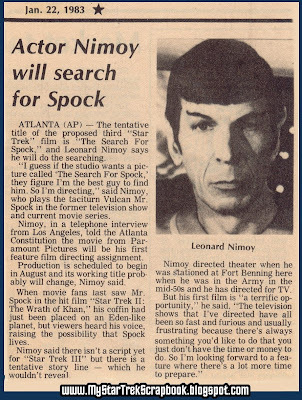 1984 "Star" article on "The Search For Spock"
Welcome, O Loyal Followers, and Curious Visitors. 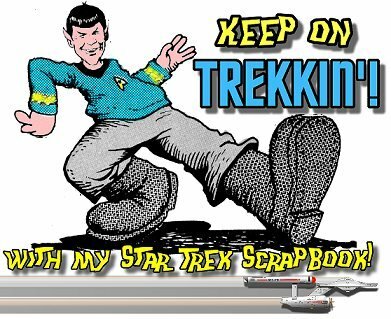 Enter in the Hallowed Halls Of Historical Trek Archives. 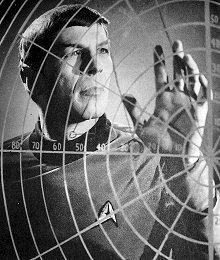 Today we're taking some "The Search For Spock" articles out of the old dog-eared scrapbook. 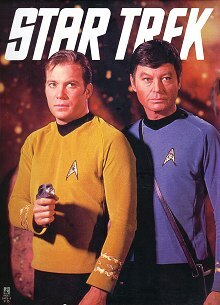 First, the "big one," the one I looked forward to with each new movie; the first color photos and information from "The Star," which managed to scoop most other publications by months when it came to the Trek movies. 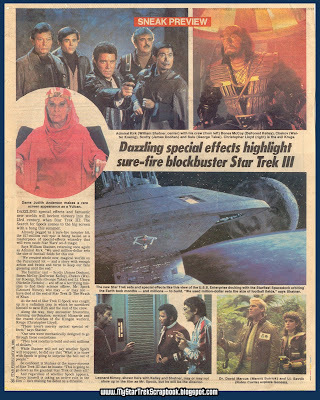 This came from the Feb. 18, 1984 edition of the tabloid, and it contained the first color photos ever seen from the new movie. This was before the instant internet publicity releases, and we fans depended on such as this to find out the latest info. Below is an article that came out the weekend of the movie's release. This is from a July 3oth, 1984 Beckley, WV paper. And below is one of the earliest announcements of the next sequel that I remember clipping, from Jan. 22, 1983. 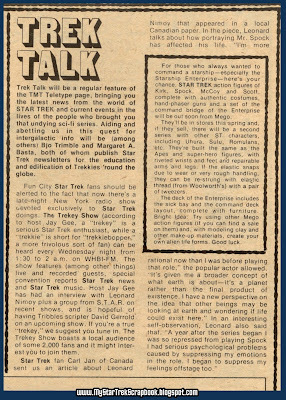 Bonus: Below is another of the "Trek Talk" features from the May 1975 issue #41 of "The Monster Times." 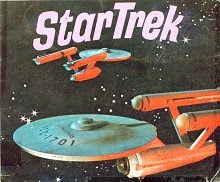 It's interesting in that it announces the "new" Star Trek figures from Mego, which so many fans that were kids back then remember with fondness. 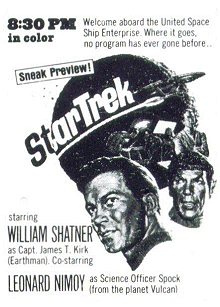 Did you know that the Apes figures predated the Trek ones? They did! 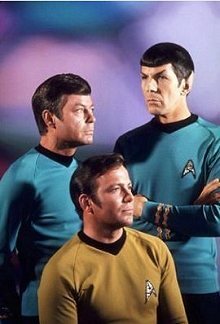 The term" Trekkers" had not yet found wide-spread use, but the "trekeys" term above (which differed only in spelling) was an early attempt to differentiate the "serious" fans from the perceived "teeny-bopper" type the media had labeled as "trekkies." Thankfully "trekeys" didn't catch on. It wasn't viable as a verbal term since it sounded just like the word they wanted to avoid, and had to be explained every time since they were on radio. And seconds later they were dead from the lack of atmosphere. As always, if any of the items posted stir up memories you'd like to share, or you just want to make a comment, I encourage you to add your voice to the discussion! A post without comments is like a tree without leaves... it's there, just not as nice to look at. 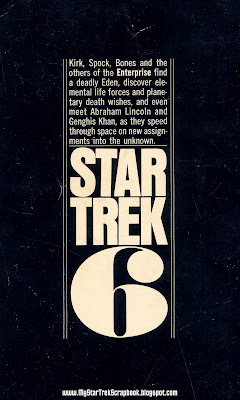 I love these old Star Trek book covers. 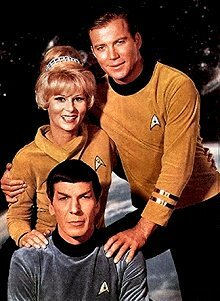 There is something mythical about them - before Star Trek became a huge money generating empire with no soul. At the time I suppose they looked modern, but now there is a retro beauty to them. I know our friend Jay will agree with you there! These old covers are special to me for the place they occupied in my heart as a young teen. Each one is like a window to the feelings and memories of that time. Frederick, I feel the same way. 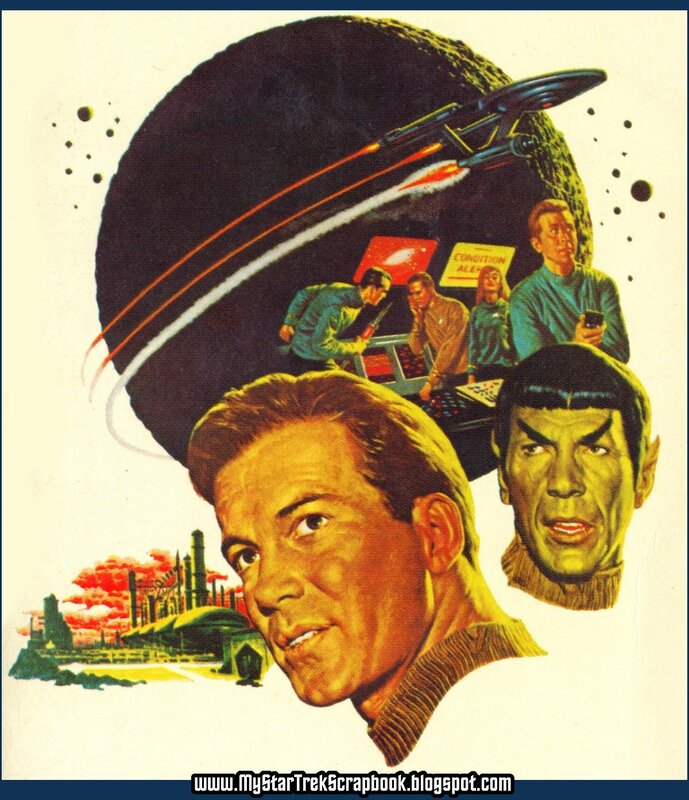 Actually the Enterprise on this one didn't look too bad, but I always thought this illustration was one of the cooler looking covers, just the 'coldness of space' look was eerie, yet neat. 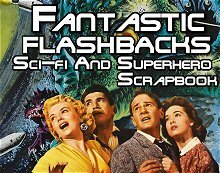 Agreeing with '4th Doctor', yes, this WAS the prime time for Trekdom, prior to the franchise 'beast' sucking up all the fun and energy and making it all seem corporate. That's why I loved the 20yr Galactica con I went to back in '98 in LA ~ It was fun, no $40 fees for someone's autograph, it was all still grass-roots in nature, and the actors like Richard Hatch were easily having a fun time with fans. Same with the Space:1999 convention with Barry Morse a few years back in Tampa, actually having in-depth, non-geek conversations with actors..
My appreciation preceeds me, yes, thus I will not again wax nostalgic about my enjoyment of all things "pre-franchise". 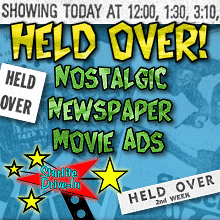 Instead I will wax nostalgic about those ancient pre-internet days when everything about an upcoming movie wasn't disected and spoiled for you a year before the movie came out. I have very fond memories of seeing "first pictures!" stories and the time I would take looking them over and wondering "wow, I wonder what's happening there" and "wow, I wonder who that character is going to be" and "wow, I wonder where that scene takes place". It was fun for the imagination. Thanks for commenting; it must have been neat to share the excitement of new pictures from the first new Trek in over a decade with fellow fans! I had no-one to share my joy with except myself. 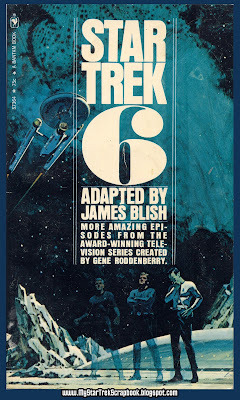 Regardless of any problems with the story and pacing, the simple fact of having new Trek, with the new expanded universe, made the movie a true event in our lives. 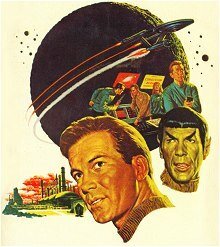 1976 article "Spock, Part 1-His Story"
1980 article on ST:TMP from "Superstar Heroes"